Pre-prosthetic surgery is a procedure or series of procedures that help to get your mouth ready for prosthetics that we will eventually add to your mouth. Depending on what state your mouth is in and what prosthetic you are having placed, different surgeries may have to take place to fix the various challenges that can come up. Your mouth is always changing and adapting to whatever the current circumstances are, so if you lose a tooth or have one extracted and don’t replace it right away, your mouth will adapt. Some of these adaptations must be undone or altered to make it friendly for prosthetics. Why do you need pre-prosthetic surgery, why not just place the prosthetic in your mouth and be done with it? Well, prosthetics can be expensive, and patients expect them to last a long time, so we want to make sure that the conditions in your mouth are conducive to whatever prosthetic that we are placing. 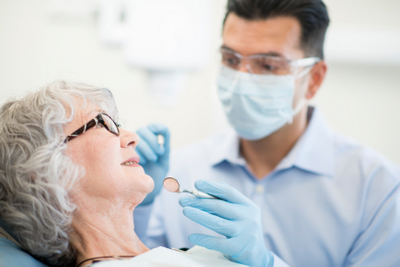 For example, dentures sit on top of your gums with the support of your alveolar ridge, also known as the gum line. This is a ridge of bone that supports your teeth and will support your dentures. If you have experienced tooth loss over a long time, there is a good chance that the bone in this ridge will have resorbed. When the bone in the gum line recedes, it can make the new denture prosthesis fit incorrectly, and can result in pain or fatigue in the mouth. It can even lead to other oral health issues. For things like dentures to be successful in the long run, it helps to plan out the prosthetic and the pre-prosthetic procedure to give the patient the best chance of success. If a patient has experienced significant bone recession in the jaw, we can plan a pre-prosthetic bone grafting surgery to give you the ability to comfortably support a set of dentures. Pre-prosthetic surgery is usually an outpatient procedure that we perform in our surgical office. Depending on your desires and the requirements of the procedure that you are having done, we offer a variety of sedation and anesthesia options. Following your procedure, you can expect some discomfort and even pain, for which may prescribe you some pain management medications. Always follow all medication directions and take as directed. If you are prescribed an antibiotic, make sure that you follow the schedule provided exactly. We will send you home with a post-operative instruction sheet which you should follow. To learn more about your prosthetic options or to schedule a no-obligation consultation, please call us today at (708) 456-7787.